Bee, both by its external characteristics (division of the body into head, thorax and abdomen, the presence of one pair of antennae, three pairs of jointed legs and two pairs of wings, etc.) and internal structure (the respiratory system is the trachea, ventral nerve cord, dorsal vessel, etc.) is referred to the animal world, the type of the arthropods and the class of insects. Insects are divided into 25-30 groups by the structure of the wings, mouthparts, development, etc. The most important groups are: butterflies (Lepidoptera), beetles (Coleoptera), dragonflies, fleas, lice, bedbugs, flies (Diptera), Hymenoptera, and so on. Bee, having two pairs of membranous wings with few branching veins, belongs to the order Hymenoptera. Hymenoptera order is divided into 22-37 families. Among these: the riders with long egg-layer, wasps, ants, bees, bumble bees, etc. 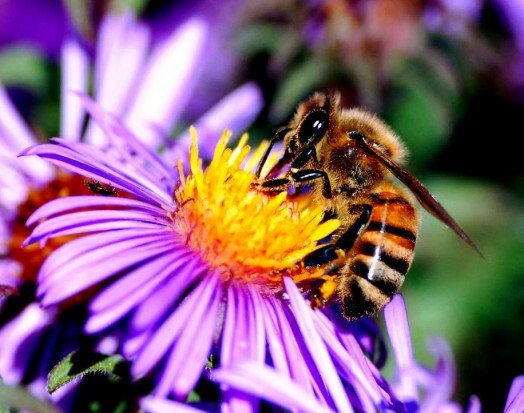 The family of bees is different in that the male antennae is of 13 segments each, and female – of 12 segments; 2nd segment of leg is simple – a single, 5th segment is greatly expanded. 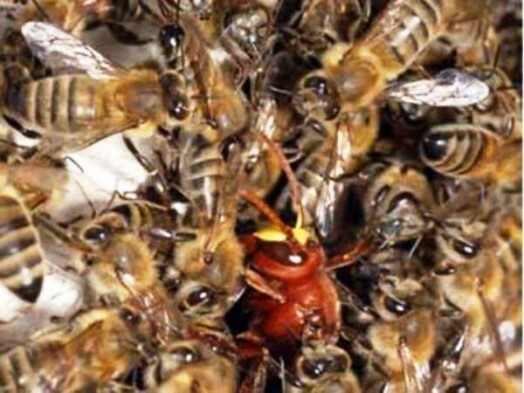 All bees (females) are equipped with stingers. 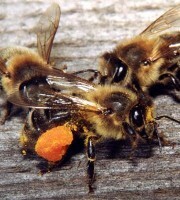 Babe are fed with a mixture of honey and pollen. 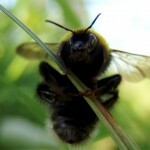 The family of bees has a very large number of species – in Europe there are more than 50. 4 genera are closest to each other: bumble bee genus, three genera of stingless bees (live in Africa and South America) and the genus of bees. 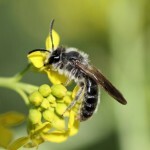 They are sometimes combined into one group, a subfamily of so-called social bees, which differs from the subfamily of solitary bees, because they have a wax gland and “baskets” on the rear legs to collect pollen, and they live in families. 1. Species as a systematic unit. The basic unit of taxonomy is the species. Species – a refined concept of “kind”, which was used for groups of similar individuals. But the similarity – a loose concept. The species is not something permanent, not limited to a uniform group of individuals with persistent characteristics, but is usually a combination of several groups, connected with each other by the transitional kinds. Consequently, the species is not the last lower systematic unit, and consists of groups that are combined into a single type. These groups are called subspecies or races. Subspecies (rather than species) inhabits a specific geographic area, which is known as zone of distribution. All the names in the taxonomy given in Latin, all kinds of groups and above are composed of the one title, and the species has a double name – generic and specific. 2. Species, genera of bees and their habitats (distribution areas). 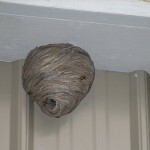 Large Indian bee 26-37 mm (1-2”). 16-15 mm. (0.7”) unknown Single cell, up to 60 cm (23”), attached to a tree branch. 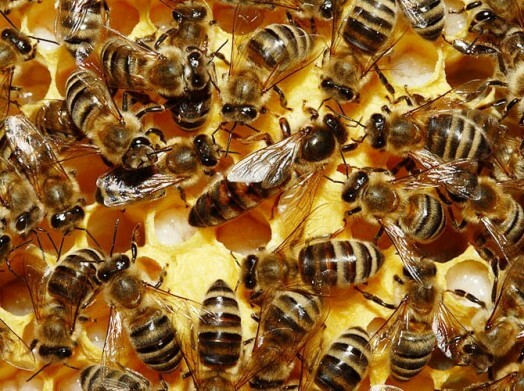 Drone cells and cells of worker bees are of the same size. The queen cells (600 pcs.) are hex, are built in the same plane with the others. Honeybees 15-20 mm. (0.8”) 9-13 mm. (0.5”) 13-16 mm. (0.6”) Single cell, up to 60 cm (23”), attached to a tree branch. Drone cells and cells of worker bees are of the same size. The queen cells (600 pcs.) are hex, are built in the same plane with the others. Indian bee unknown 11.8 mm. (0.5”) unknown The same, with the difference that there is just several queen cells. Dwarf bee 13 mm. (0.5”) 7-8 mm. (0.3”) 12 mm. (0.5”) Single cell, up to 15 cm (0.7”), attached to a tree branch. Drone cells are cylindrical and are arranged in the same plane with the others. Single queen cells are like of a honey bee. 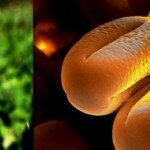 Evolution of insects is closely related to the evolution of plants. With the appearance of the first flowering plants, the insects, feeding on nectar and pollen, appeared. There is no transitional kinds between different genera of bees and now living representatives of bees abruptly became isolated from the rest of the family of bees. There are few transitional kinds among fossil bees. Most authors believe that in the tertiary era bees inhabited Europe, Asia and Africa. In America and Australia, there was no bees in the most ancient prehistoric times. Then changes in climate in Europe and other countries, due to the onset of the ice from the north, greatly reduced the area of bees. There is reason to think that members of the honey bee family saved at that time in the Caucasus, in the south of Europe and Africa. 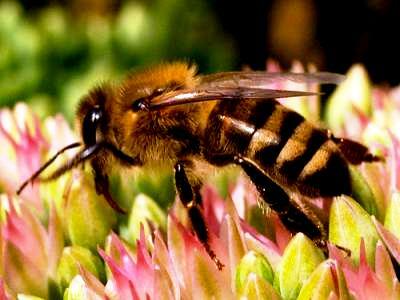 Therefore, some researchers believe that the Mediterranean Sea is home to the honeybee. Modern bees of Central and Northern Europe are the result of secondary postglacial settlement of bees. 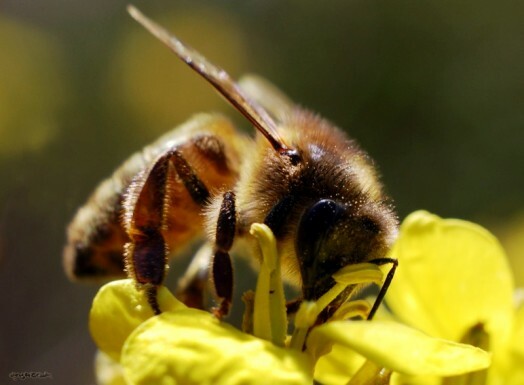 Bees in the Caucasus remain from the tertiary period to the present time and there is a possibility that the Caucasus and Asia Minor is the second permanent habitat for bees. As for the other species of bee, the two types of bees – Large Indian and Dwarf bee – live in the Indian subcontinent, Indochina and the island of Ceylon, Java, Borneo and the Philippines. These bees are known only in the wild. 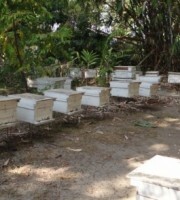 Attempts of F. Bay and other beekeepers to keep Indian bees in special bee hives failed. 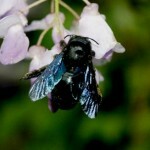 The third type – the Indian bee – is common in India, China, Japan, the Far East and Africa. Indian bee can be, although with difficulty, domesticated. According to I. Tokuda, Japanese and Chinese bee does not get along in the same area with the honey bee. This is explained by the fact that the honey bee in no harvest time completely plunder all honey stocks of Japanese or Chinese bees. During the attack Japanese bees do not pay attention to thieves and do not have any resistance to them. Japanese bee sting thieves reluctantly, as “shy”. Japanese bees, even when giving them the eggs, do not breed sinus queens and planted in the hive queen bee is left unattended. 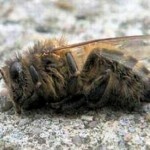 All this leads to the fact that in areas where there is a honey bee , the Indian bee begins to disappear. Indian bee is of little agricultural value and at home, and it seems, it is doomed to extinction, at least in areas, where they keep honeybees . This is confirmed by the fact of the presence of Indian bees in Africa, showing that the area of the Indian bees dwelling in past was much wider than the modern. 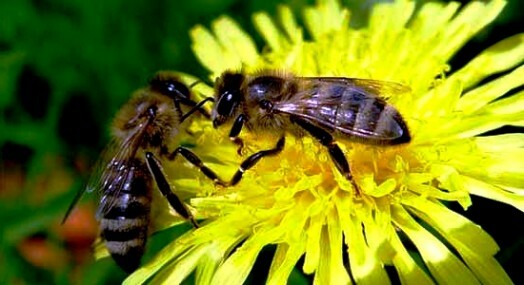 Honey bee is a species, the most abundant with small systematic units. Some authors consider them as a species, but others – subspecies. It is wrong to allocate one or the other groups of the honey bee in separate species by a small number of features (mainly morphological). Species can not be characterized without assuming any obvious errors, if you do not take into account the geographical distribution, the ecological characteristics of groups that make up the species, the modification variability of these groups. Species is a complex, moving morphological and physiological system, linked by its origin with a certain environment and habitat. Combined species includes a number of subspecies. In contrast to the species, sub-species are combined with other subspecies by the full range of transitional species. In terms of evolution, the basic difference between subspecies and species does not exist: if transition individuals disappear, then subspecies turn into species. In other words, sub-species – are emerging species. 1. Europe, the Near East, Africa and Madagascar are inhabited by one group of bees, which has one name. 2. There was no bees in Asia, the Americas and Australia. It was delivered by people. a) European Honey bee (area – Europe without the Caucasus). 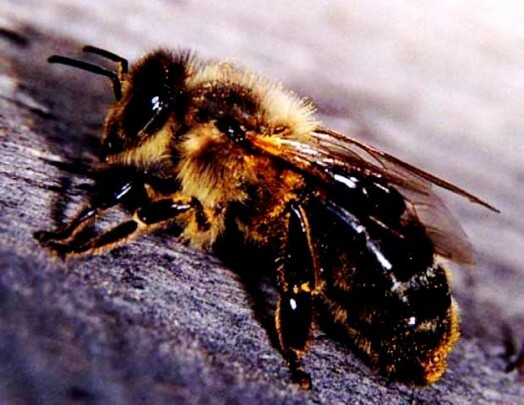 b) Caucasian Honey bee (area – Caucasus). 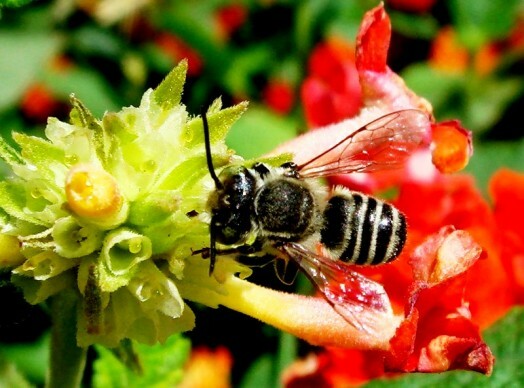 c) African Honey bee (area – Africa and Madagascar). 3. Group of bees inhabiting the Near East (countries: Turkey, Syria, Palestine, Arabia, Iran, Iraq and Afghanistan). Until now, the study of small systematic units of honeybee is limited mainly to the external morphological features. 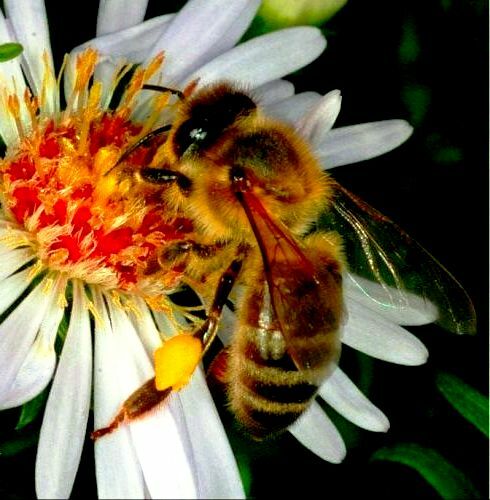 Authors describe the honeybee subspecies by color, size, length of the proboscis, wing venation, color of abdominal segments of drones and other features. Based on a critical view of literature, it is possible to divide a species of honeybee to the following subspecies. 1. A typical honeybee. The bee is gray (black) with a little of yellow color. Drones have uniformly dark brown coloring (with some light transverse stripes). Queen is highly variable in color. Bees are usually more aggressive in northern locations than in the south. They built 20-30 queen cells. Area – the northern and central part of Europe. 2. Krajina honeybee. These bees are bigger than previous subspecies. Abdominal segments of drones are covered with whitish hairs. Bees are peaceful. 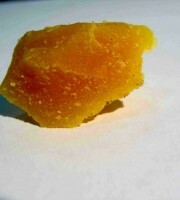 Honeycomb seal is white. Their area – Central Europe (Norim, Carniola and Carinthia). 3. Italian honeybee. Bees are yellow, with a little touch of gray. Drone side abdominal segments are yellow with black spots. Bees are peaceful. Area – Apennine and southern part of the Iberian Peninsula. 4. Cyprian honeybee. Yellow in color, they are the lightest bees. They are very malicious, smoke does not help. The area – Cyprus. 5. Caucasian honeybee. This bee is different from the European by transparent honey sealing, as if it is wet. They are peaceful, proboscis is longer than of other subspecies. a) One color honeybee. Gray bee. Its habitat – the northern and western part of Africa and Madagascar. b) Yellow honeybee. Area – middle and southern part of Africa. 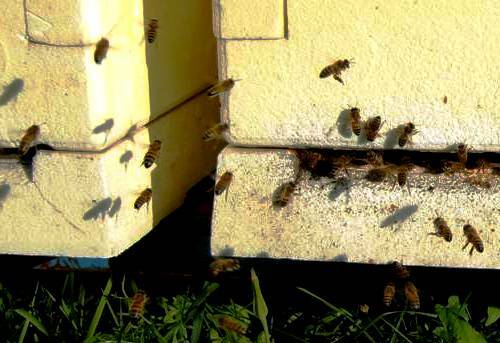 African beekeepers value it more than the previous species. It builds 5-7 swarms queen cells. Bee is well adapted to the local climatic conditions, and attempts to replace it with the Italian bee were unsuccessful. c) Egyptian honeybee. Yellow bee. Its habitat – Egypt, valley of the Nile and the Red Sea coast, Asia Minor. 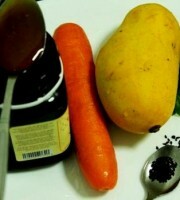 Make wet seal of honey. During swarming they build up to 100 queen cells, all queens live together peacefully, until one of them does not mate with a drone. They are angry bees, smoke almost has no effect on them. By Abushadi Egyptian bees do not make propolis. 7. Syrian honeybee. Yellow bee. Lays up to 200 queen cells. Way of life is similar to the Egyptian bee. 8. Persian honeybee. Yellow and angry bee. Lays a lot of queen cells. 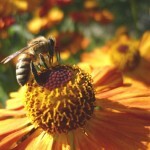 The problem of implementation in beekeeping of other members of the subfamily of “public” bee has no agricultural value. 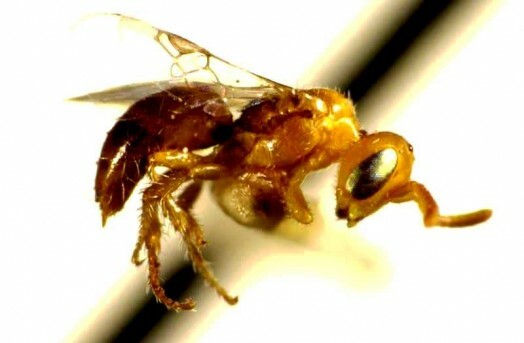 Stingless bees are not widespread in agriculture. Their nests consist of a pile of cells of irregular shape, sometimes greatly elongated, interconnected with wax rails. Some stingless bees build specific cells – pots like chicken eggs. To take honey you have to destroy the whole nest.